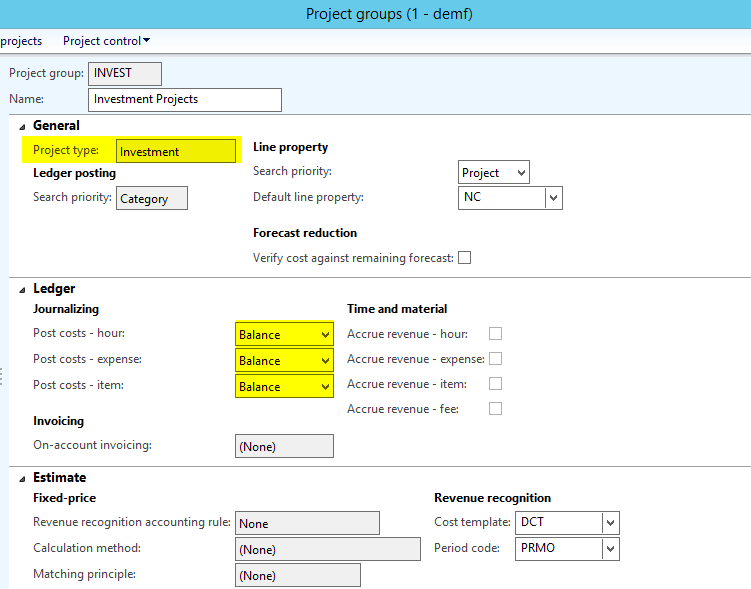 This blog post illustrates how you can use the Dynamics AX project module to track the costs of constructions in progress and transfer those costs later on to a fixed asset once the construction is finished. Before you are able to track the costs of your construction in progress you have to ensure that an investment project group is setup that accumulates all costs on balance sheet accounts as illustrated in the next screen-print. … that you use for recording all construction costs. In my case, I recorded hour, expense and item costs that add up to a total of 17300 EUR as shown in the next screenshot. Once your construction project is finished and provided that all costs have been recorded on your project, you can transfer those costs to a fixed asset by using the estimate function. 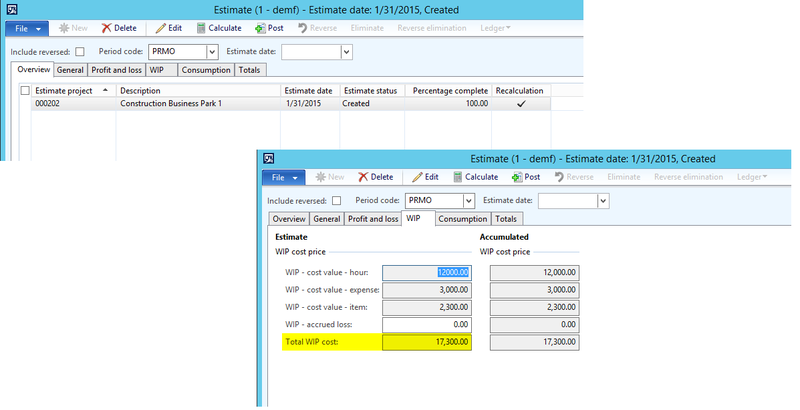 The first step required in the estimate form is creating an estimate that accumulates all costs recorded. 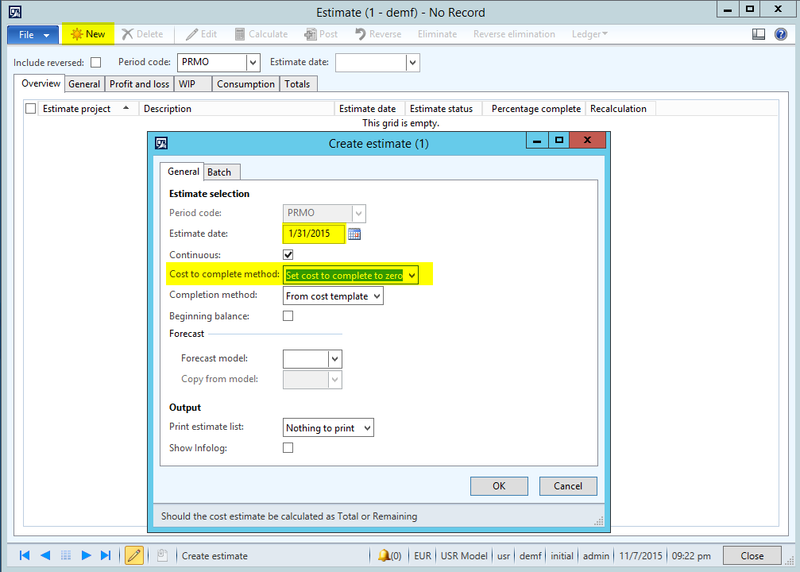 This can be done by selecting the “set cost to complete zero” cost to complete method. The next steps required are (a) specifying the fixed asset to which you want to transfer all costs and (b) posting the estimate. Please note that posting the estimate does not create any ledger transaction and does not transfer any costs to the fixed asset selected. To do the actual transfer of the costs to the fixed asset, you need to eliminate the posted estimate by using the corresponding functionality. After the elimination is done, you can identify the costs on the fixed asset selected before. Those steps need to be repeated every month as long as your project runs. An alternative to reversing and repeating eliminations recorded before, you can separate your investment project into subprojects that are eliminated successively as the construction progresses. If you are eliminating your construction projects on a regular basis, those costs are included in your fixed asset module and thus in your fixed asset statement. 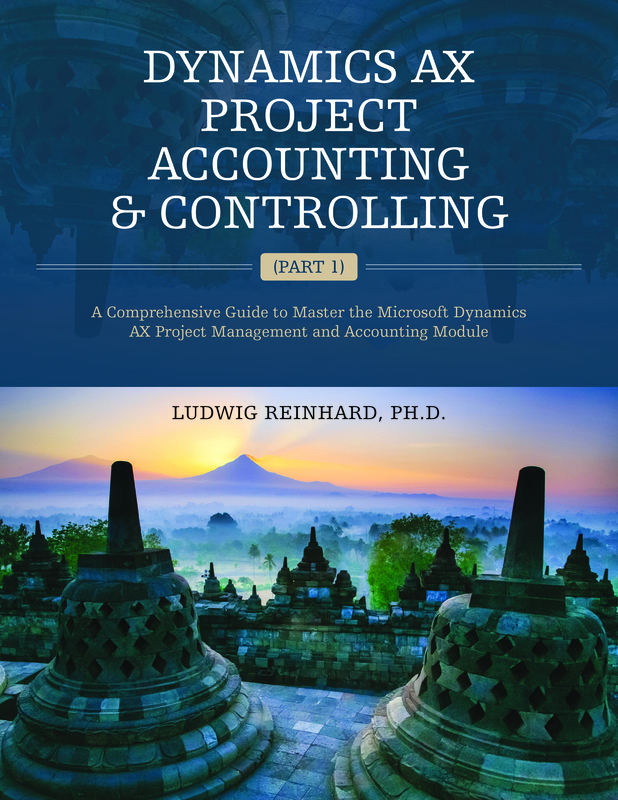 If, on the other hand, you are not eliminating your project construction costs on a regular basis, all costs are accumulated in WIP (balance sheet) accounts only and are not included in the standard Dynamics AX fixed asset statement. In order to get your fixed asset statement right, you thus need to include the WIP accounts in your fixed asset statement which requires that you either use the Management Reporter for your fixed asset statement (see the previous post) or that implement a system adjustment. The following screenshots provide you some additional information on the fixed asset posting profile setup used for the examples illustrated in the blog posts. Please not that separate ledger accounts are used for each combination consisting of (a) the fixed asset transaction type, (b) the fixed asset group and (c) the value model. Please note that the sales disposal parameters illustrated in the following screenshot could be setup in more detail. Yet, the major point that I want to make here is that the ledger accounts that are setup in this section differ from the ones used for recording the original fixed asset transaction. As an example, fixed asset acquisitions are recorded on ledger account 180500, while the offset transaction that is recorded when the fixed asset is sold is recorded on ledger account 180502. As for fixed asset sales, separate sub-ledger accounts have been setup for recording the scrap of fixed assets. For details, please see the next screenshots. The last screenshot included here shows some additional details of the ledger account setup. The term “PKW” included in square brackets represents the fixed asset group. The following illustrations on the setup of the fixed asset statement in Management Reporter will be done by referring to sample fixed asset transactions that directly address the problems of the standard Dynamics AX fixed asset statement report mentioned previously. For that reason, the following transactions have been recorded for six fixed assets (“FA0035” to “FA0040”) in 2017. 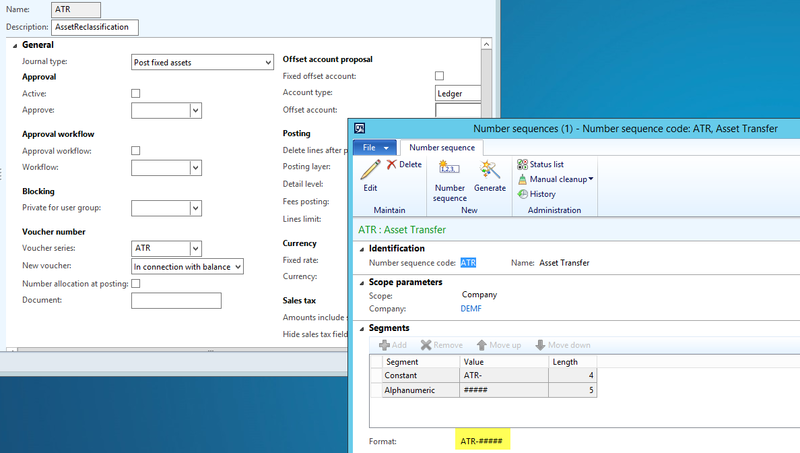 After recording the fixed asset transactions illustrated in the previous screenshot, the following row definition is setup in Management Reporter. 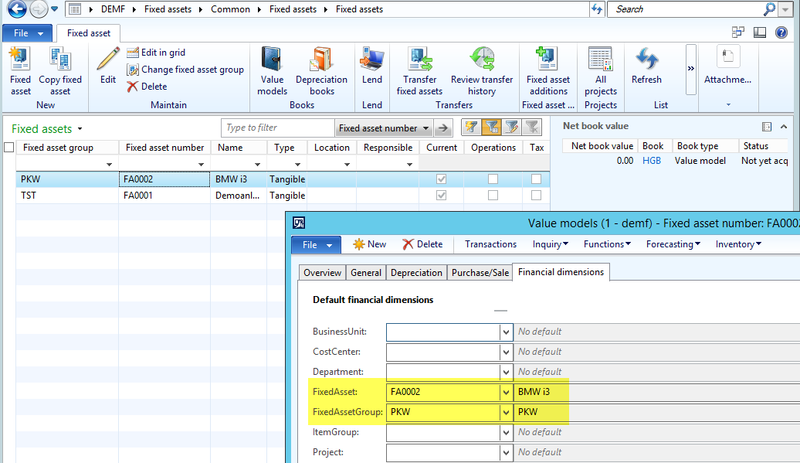 What you can identify from the previous screenshot is that the fixed asset group financial dimension values, (e.g. “PKW”, “MA”, etc. ), have been mapped to the different rows of the fixed asset statement report. 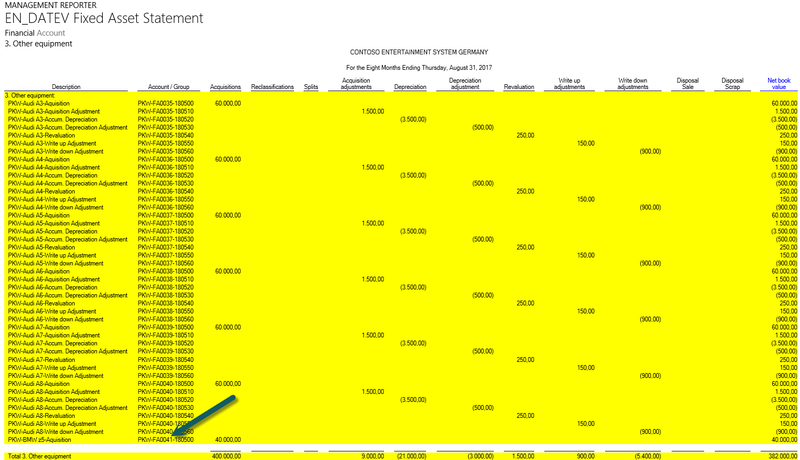 In addition, two main accounts are included in the report and mapped to the rows in the financial asset section. This flexible way of setting up and mapping any combination consisting of main accounts and financial dimension values allows including also those fixed assets that are not tracked in the fixed asset module but in General Ledger. As a result, the fifth issue of the standard fixed asset statement report mentioned previously can be considered to be fixed. 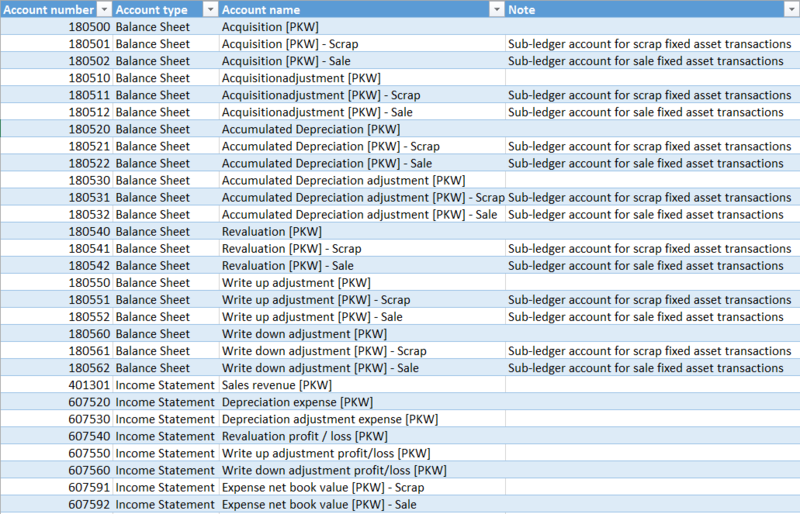 After setting up the row definition, the column definition of the fixed asset statement report is setup. This setup is realized by adding the different fixed asset transaction types – such as acquisitions, depreciation, etc. – to separate report columns and by filtering on the main accounts that are setup for the different transaction types. Please see the next screenshot for an example. Note: In order to separate fixed asset reclassifications and fixed asset splits from ordinary fixed asset acquisition transactions, an additional attribute filter has been setup in the column definition of the report. My next step consisted of merging the row and column definitions into a new report and processing this report. The next screenshot shows the outcome of this process. Please note that the different transaction types and values posted can easily be followed up from the fixed assed statement report generated. By clicking on the data reported in the fixed asset statement report, users can execute a drill-down into the data that make up the total amounts reported. 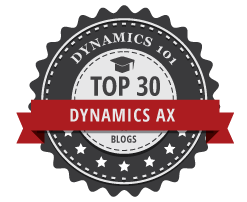 If this drill-down does not provide sufficient details, the respective Dynamics AX voucher can be opened as illustrated in the next screenshots. As a result also the fourth issue of the standard Dynamics AX fixed asset statement report can be considered to be fixed. A drill-down into the total acquisition value shows that the newly created fixed asset is automatically added to the fixed asset statement report. For that reason, also the first issue of the standard fixed asset statement report can be considered to be fixed. The second issue of the standard fixed asset statement report – the fix link between fixed asset transaction types and report columns – can be overcome by setting up alternative Management Reporter column definitions, which can be selected when running the fixed asset statement report. 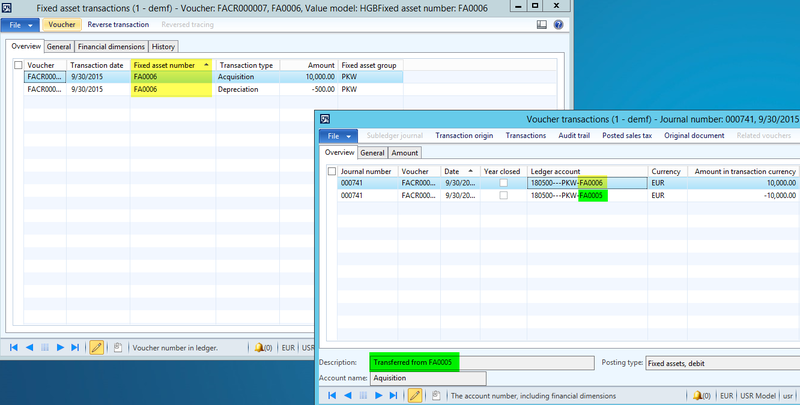 The next screenshot shows you an example how different fixed asset transaction types can be combined into a single column by filtering on the ledger accounts and vouchers setup. The last remaining issue of the fixed asset statement report – the limitation to one single row structure – can be fixed simply by setting up a new (alternative) row definition that is selected once the fixed asset statement report is generated. 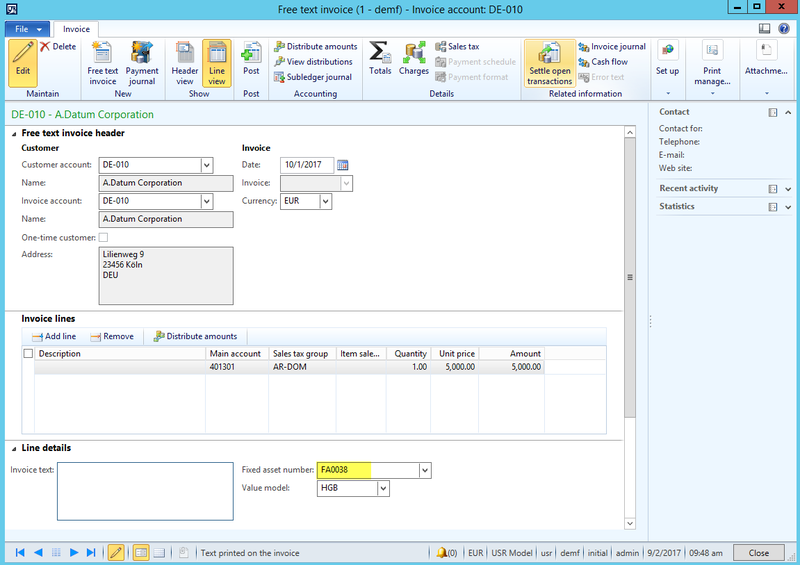 The next screenshot provides an example of an alternative Management Reporter row definition. Please note that also the column definition needs to be modified in line with the newly setup row structure. If you combine both elements in a new report, basically any fixed asset statement format required can be realized. After investigating solutions for the problems of the standard Dynamics AX fixed asset statement report, I will now put a focus on some “special” fixed asset transactions and how they are included in the fixed asset statement report in the Management Reporter. 01. September via the following fixed asset posting journal. Result: The scrap of the fixed asset can be identified in a separate column of the fixed asset report due to the use of separate ledger accounts for scrap transactions. For details, please have a look at the fixed asset posting profile setup in the appendix. Note: To follow up the special transactions illustrated in this subsection, the fixed assets affected are shown at the bottom of the fixed asset statement report in separate rows. On 01 October a fixed asset („FA0038“) with a net book value of 57000 EUR is sold for 5000 EUR. The asset is sold via the free text invoice as illustrated in the next screenshot. Taxes are disregarded for simplicity. Result: The sale of the fixed asset can be identified in a separate column of the fixed asset report because separate ledger accounts have been setup for fixed asset sales transactions. For details, please have a look at the fixed asset posting profile setup in the appendix. 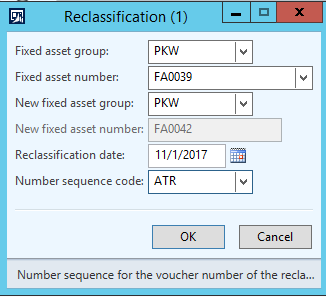 The next special transaction is the reclassification of a fixed asset (“FA0039”) into a new fixed asset (“FA0042”) that Dynamics AX automatically creates. Result: The next screenshot shows that the reclassification of the fixed asset is recorded in the reclassification column of the fixed asset statement report. In addition, all transactions that have been recorded for the old fixed asset “FA0039” are transferred to the new fixed asset “FA0042”. The last transaction illustrated here is the split of a fixed asset. In the example used, 10% of the fixed asset value of fixed asset “FA0040” are transferred to another fixed asset “FA0043”. 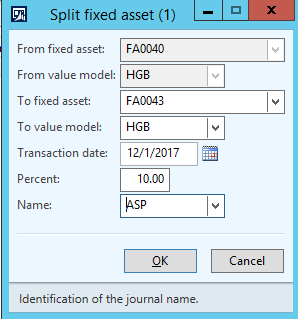 Result: Due to the setup of a voucher filter in the row definition, the fixed asset split transaction can be included in a separate column of the fixed asset statement report as illustrated below. After illustrating the different issues of the standard fixed asset statement report and after introducing an approach to overcome those issues, it can be summarized that all weaknesses of the standard fixed asset statement report can be fixed by implementing some minor system adjustments and by setting up the fixed asset statement report in Management Reporter. Please note that the automatic creation of fixed assets via purchase orders and processes related to organization wide fixed asset identifiers have not been investigated in this post. If your company uses those processes, you need to investigate whether the one or the other additional system modification might be required. Irrespective of this qualification, I believe that the drill-down functionalities, the flexible setup options and the possibility of setting up a comprehensive fixed asset statement report that does also include prepayments, financial assets and alike, are major advantages of the approach presented here. In addition, the possibility of setting up different row and column structures to create fixed asset statements for different reporting purposes (local GAAP reporting, tax reporting, IFRS reporting, etc.) 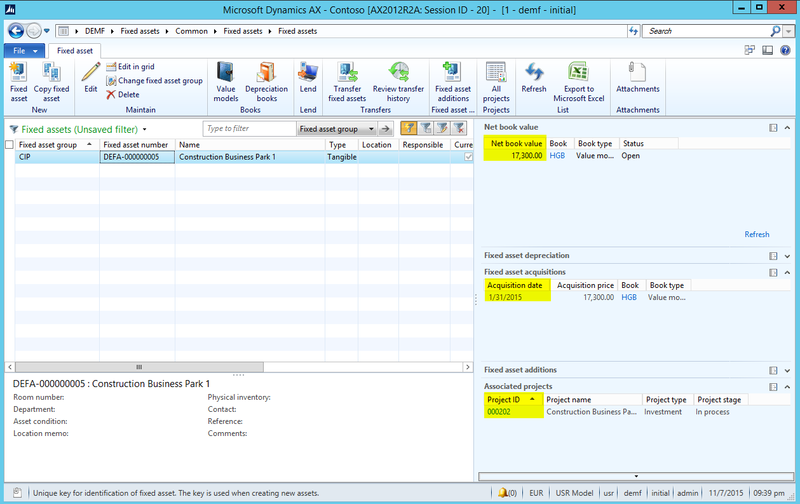 is an advantage that can hardly be achieved with standard Dynamics AX SSRS reports. 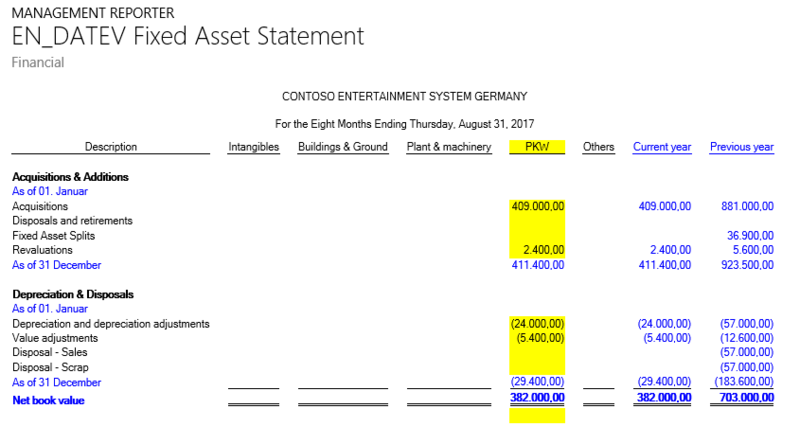 The German language version of this blog post focuses on the question whether Dynamics AX is able to generate a fixed asset statement report that is in line with the German commercial code respectively the fixed asset statement report of the local German standard setter “DATEV”. 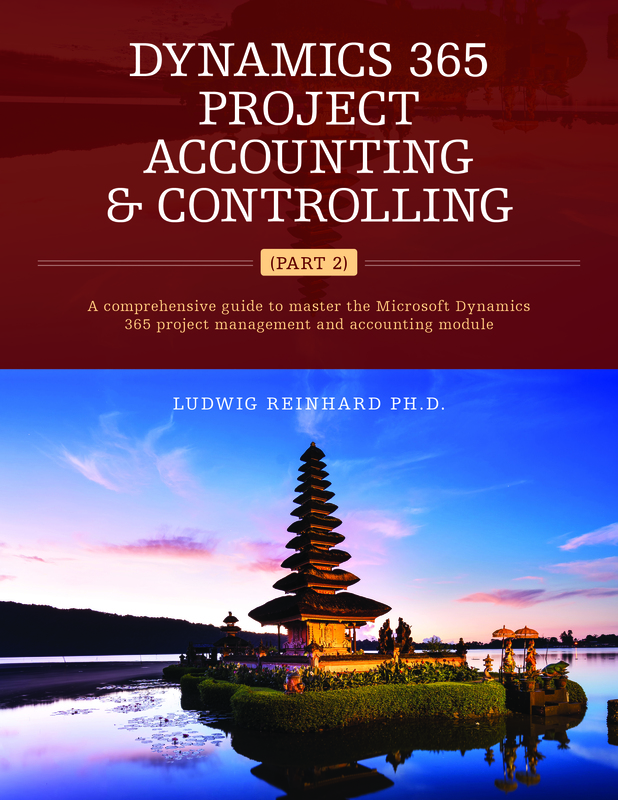 Due to its country-specific nature, the German language version of this blog post might not be interesting for Dynamics AX users in other countries. For that reason, I decided to use a more generalized approach in this English language version by focusing on the major issues of the fixed asset statement report(s) available in the fixed asset module. Note that I use the term “reports” because Dynamics AX ships with several different country-specific fixed asset statement reports. As a result, not all issues that I mention in the following might be applicable in the country your company operates. 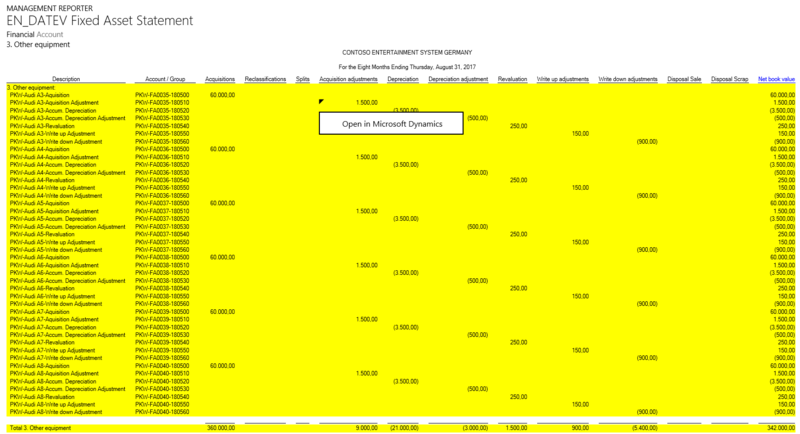 Irrespective of this limitation and the different country-specific report versions, I hope that you might get the one or the other useful information out of this post that can be used in your Dynamics AX system. (Please note that this blog post will be split into three separate blog posts for reasons of readability and due to its length). Newly created fixed assets are not automatically included in the fixed asset statement report but rather need to be assigned manually in the fixed asset statement row setup window as this setup window does not allow using wildcards. The fixed asset statement report columns and the fixed asset transaction types are linked via program code and cannot be modified by users as required. 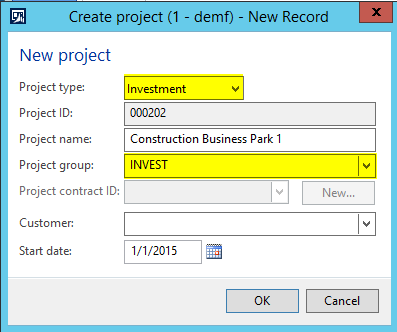 Fixed asset statement rows can only be setup in one format. Different row formats that are required for the representation of different accounting standards (local GAAP, IFRS, US-GAAP, etc.) are currently not supported. The standard Dynamics AX fixed asset statement report does not provide drill-down functionalities that are necessary for a detailed analysis and reconciliation of the fixed asset statement data. Prepayments made for fixed assets, financial assets – such as long-term investments – and alike are often not recorded in the fixed asset module but rather tracked in General Ledger. As many local standard setters and governments require that those assets are included in the fixed asset statement report, subsequent changes/adjustments are needed. The following chapters provide you numerous examples that answer the question how the different issues of the fixed asset statement report mentioned above can be solved. Please note that for reasons of simplicity and illustration, the examples used below refer to a single fixed asset group (“PKW”), a single value model (“HGB”) and a single fiscal year. Yet, the proposed solution can easily be extended to several fixed asset groups, value models and fiscal years. The proposed solution for overcoming the issues of the standard Dynamics AX fixed asset statement report consists of setting up the fixed asset statement report in the Management Reporter. To realize this, the following setup steps are required. The first setup step required is setting up the fixed asset posting profile in a way that ensures that each combination consisting of (a) a fixed asset transaction type, (b) a fixed asset group and (c) a value model is setup with a separate ledger account. Please note that the setup of the fixed asset disposal transactions (sale, scrap) also need to follow this principle as the Management Reporter cannot directly access the various fixed asset transaction types that are required for setting up a fixed asset statement. Note: For additional details on the ledger account setup, please have a look at the fixed asset posting profile setup that is illustrated in the appendix. The next setup step required comprises (a) the setup of the automatic financial dimensions for fixed assets and fixed asset groups and (b) the corresponding setup of the account structures in the General Ledger module. Please see the next screenshot for an example. 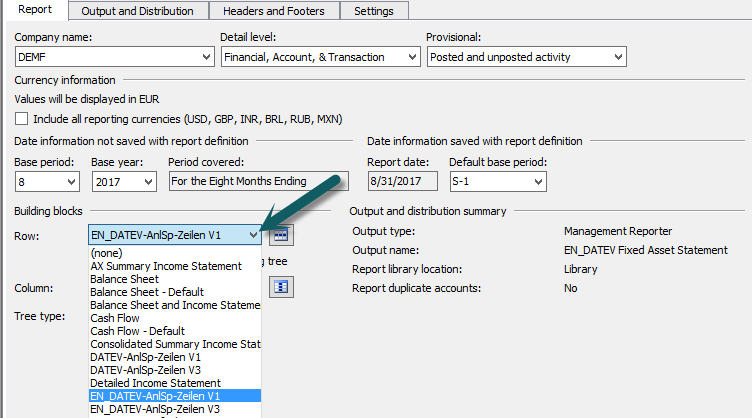 As this second step is required for the subsequent setup of the fixed asset statement rows in the Management Reporter, the General Ledger account structures for the balance sheet accounts and income statement accounts need to be modified as exemplified in the previous screenshot. To ensure that all fixed assets are automatically setup with their fixed asset group & fixed asset financial dimension values, a small code modification is required, which is illustrated in the next two screenshots for the AssetBook table. This code modification consists of (a) the creation of a new method (“SetFDFA”) and (b) the adjustment of the table’s insert method. Please note that this code modification is required for the AssetBook table and the Asset table. After the code modification is implemented and a new fixed asset is setup, the automatically defaulting fixed asset group and fixed asset financial dimension values can be identified in the value model window of the newly created fixed asset. Note: Due to automatic fixed asset transactions that do not allow a direct user interference, such as fixed asset reclassifications, the code modification illustrated is inevitable if you want to setup the fixed asset statement in the Management Reporter. In addition to the code modification shown in the previous step, a second code modification is required that handles the reclassification process of fixed assets. The fixed asset reclassification process is typically used when the construction of a fixed asset – such as a production hall, machine, etc. – is finished and all costs that were allocated to the “construction in progress fixed asset” are transferred to a newly created fixed asset. The next screenshots illustrate the problem of asset reclassifications and show you why a code modification is needed. Example: For a fixed asset under construction “FA0003”, total costs of 10000 EUR and 500 EUR depreciation costs were accrued. After the construction of the fixed asset is finished, it is reclassified into a new fixed asset “FA0004” via the periodic reclassification functionality. 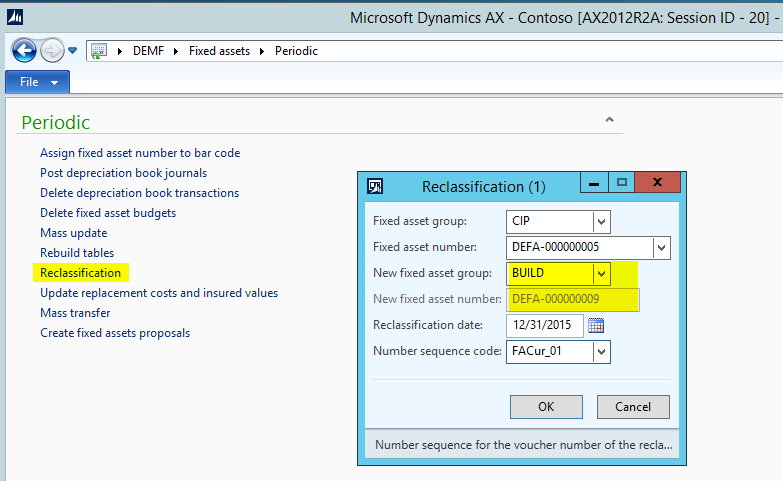 Please note that users cannot influence the newly created fixed asset (“FA0004”) that is setup, as Dynamics AX creates this fixed asset automatically. This can be identified by the grey-highlighted cell in the previous screenshot. 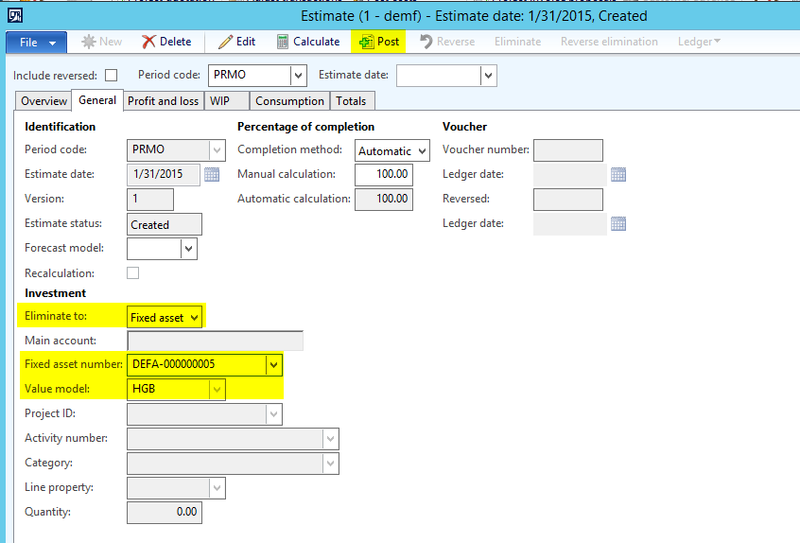 Without a system modification, Dynamics AX creates the following voucher for the old and new fixed asset. What you can identify from this voucher is that all transactions are recorded with the fixed asset financial dimension of the old fixed asset („FA0003“). As this standard Dynamics AX behavior prevents the setup of a fixed asset statement report in the Management Reporter a system modification is required. Solution: The problem illustrated can be fixed by adding the following code line in the AssetReclassification class. With this code modification, the fixed asset transaction of the old fixed asset is recorded with the old financial dimension value and the new fixed asset transaction is recorded with the new fixed asset dimension value. 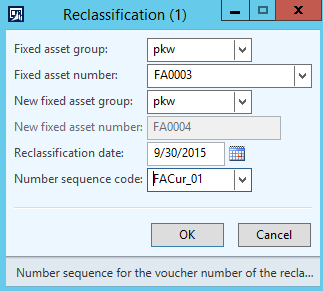 The following screenshot shows this change in system behavior for the reclassification of an old fixed asset (“FA0005”) into a new fixed asset (“FA0006”). Dynamics AX does not have separate fixed asset transaction types for recording fixed asset reclassifications and fixed asset splits. If you want to report on those transactions separately in the fixed asset statement report you thus have to setup separate fixed asset posting journals in General Ledger. The number sequence used for those journals can then be used for identifying fixed asset reclassifications and fixed asset splits in the Management Reporter. For details, please see the examples in the next blog post.